Miss Beckwith and Mrs Green are looking forward to meeting the new Red Class. We both hope that you have had a good break and are now rested and raring to go! This term our focus will be on Roman Britain. We will be exploring what Roman Britain was like and why the Roman's wanted to invade. We will also be learning about life in the Roman Army and we are hoping to invite a Roman Soldier into school. Look at our topic web to find out more about what we will be learning about this term. 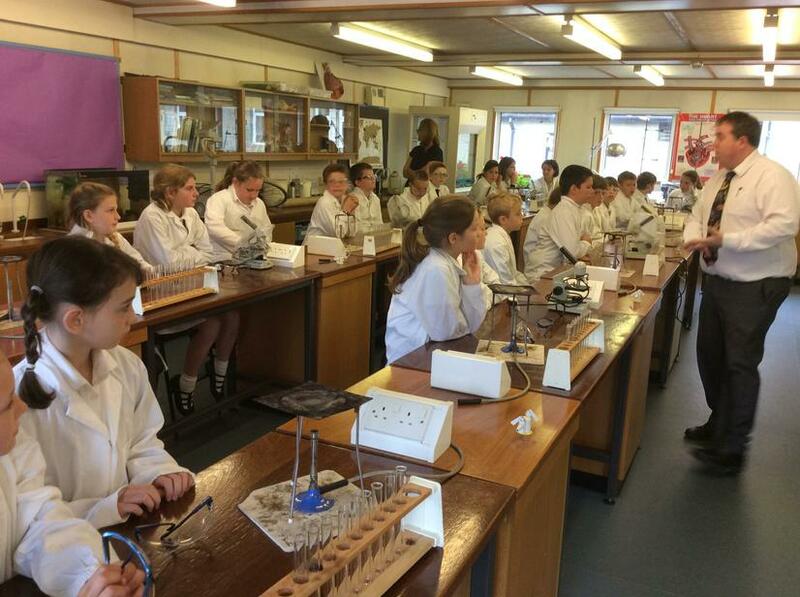 Forensic Science at St Mary's School in Shaftsbury. 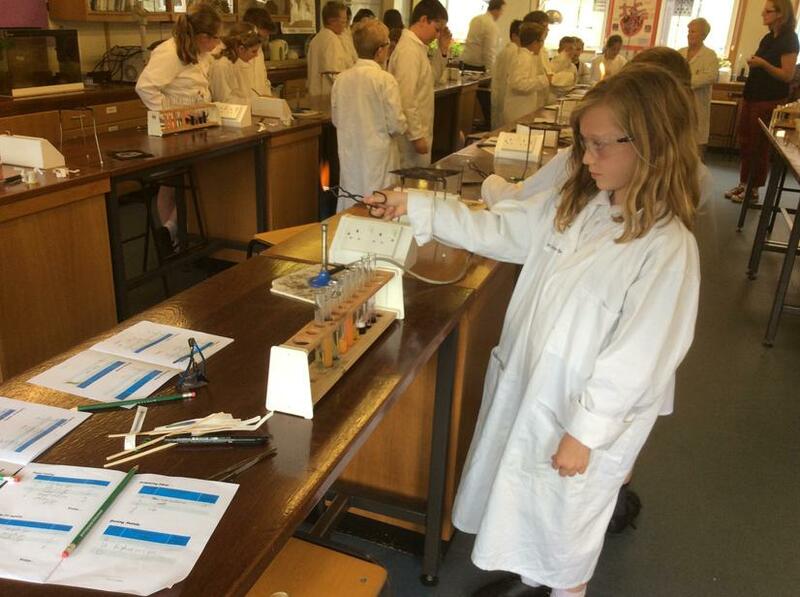 We recently visited the science labs at St Mary's school and used their equipment to help us solve a crime. 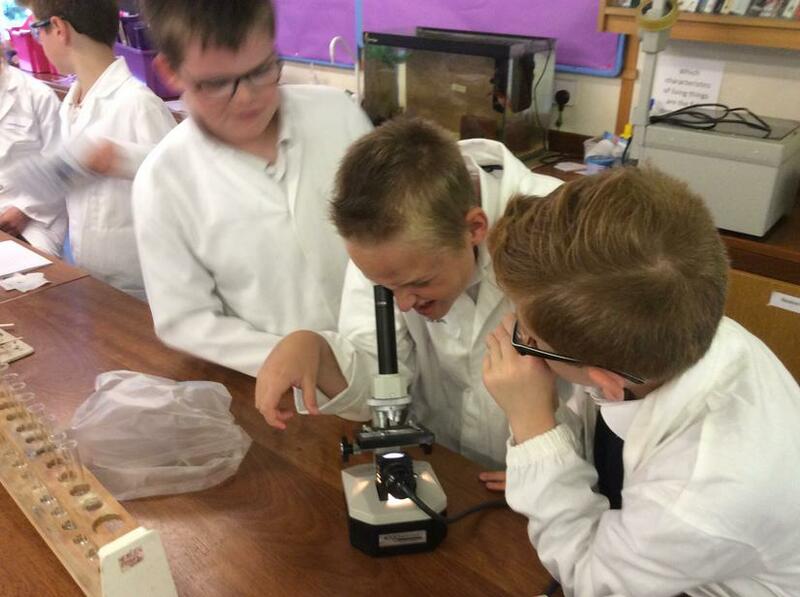 Red Class has had a fantastic week. I have seen some outstanding examples of teamwork and some great positivity. The children have challenged themselves and have supported each other when overcoming fears. 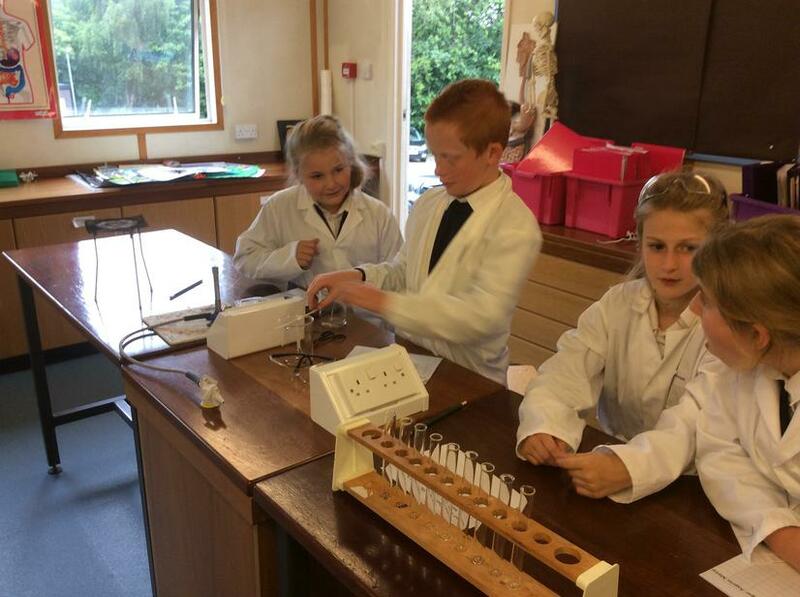 They have made me incredibly proud and as well as watching them develop new skills outside the classroom I have also seen them develop skills that you will be able to use at home. The staff at Pencelli were very impressed with their good manners and their ability to eat every single piece of food provided each day (including the contents of the fruit bowl) Some children even had six helpings! I would also like to thank Mandy Green and Nick Beale for volunteering their time and their support this week. Today both groups canoed along the canal. Today the children in both groups showed some excellent canoeing skills and they all pulled together. All the children were very encouraging. Jess's most encouraging moment came when Mr Beale had just carefully stepped on board his canoe.
" Wow! That went down quick!" What Black Group thought about...caving. Caving was the activity for today. We got on the bus for 10:15 ish and arrived around 11. We got into our gear and in we went. Our challenges were: The Toilet (although the actual toilets were a bit challenging too! ), The Gun Barrel, The Worm Hole, The Badger Hole and The Letterbox. All in all it was great! What Orange Group thought about...Rock Climbing! It was fun! We went up to the top and it was amazing!! But it was hard work getting up those rocks!!! Top tip of the day! Today we saw great team work. Lots of people supported each other and everyone challenged themselves. Lily-Mai " I didn't think I was going to like caving but I love it!" "Mrs Green you look good....that caving suit makes you look just like a farmer!" After learning all of the safety rules, we were put to the test to see if our new skills would help us. Teamwork came together as someone put their lives in our hands. Fears of heights were defeated, some people saying they could only climb a few steps but they ended up challenging themselves and going five more. 'Trust us' was our logo for when people stopped. Everyone else was encouraging, never letting go. "Do I have to come down?" Shane asked after getting to the top and realising he had to go down. Libby's motto- "Get your head in the game!" Every morning the children have to do a job. Black Group's job is to sweep the dry room and around the outside of The Lodge. Martin (our instructor) gave the boys in our group the following instruction.. "Brush to the wall boys". Instead of leaning their brushes by the wall the boys started to brush the walls of The Lodge. Mudslides and mud climbs - one step up and three steps back! Ben's tooth finally fell out! In Red Class today we have been doing art with Mrs Loxton and it was really fun. We did some forest art. Did you now a football pitch of trees gets cut down every second in the raniforest? In Red Class this week we have been writing descriptive paragraphs about the Amazon rainforest. When I walked in to the forest I felt a little bit scared because I had never been where we were going. Then all of a suddenly I saw myself on my on my own in the forest . I felt something flow past me that made me fill even more scared. THEN I started to run. I fell over. I felt cold and muddy. I got up and started to walk on. The trees were towering over me. It was as if I was imprisoned by them. When I started to see daylight, I started running by it was just my imagination. I think it was because I was so thirsty. I thought I was going to faint. Mr Rich gave me 5 house points! I think it is the best piece of writing that I have ever done. Hello again, I'm going to write a mix of lessons. First I'm going to talk about maths; in maths we are using thinking blocks on the iPads. Some of you know what thinking blocks are but some people don't know what it is. The app is from Singapore. Now I'm going to talk or should I say type about literacy; in literacy we are learning how to structure a story and to describe a setting then Miss Beckwith, our teacher, read us the tale of The Great Kapok Tree then we had to write and draw what speech was said. It has been a busy week, I wish I could tell you more but time’s up so I have to go. We cant leave are parents waiting can we? Well we could but if we let them freeze we wouldn't have sausage and mash for dinner and who cant live without sausage and mash for dinner? Well some people can but I definitely can’t. In Red Class we are going to King Alfred's Tower. We can’t wait! We are going on Thursday. We will be going on an Adventure walk. In maths we are working on the Singapore bar method to solve adding and subtraction word problems . Right angles, obtuse angles, reflex angles, acute angles, going out of my mind angles! By the way the last angle is not true I made it up do you like it? Have you heard the word ‘protractor’? Well I definitely have many times today..! If you don't know what it is, it is something that you measure shapes with and something that gives you a headache if you look to closely. With a protractor you have to have good eyes to get the line spot on. If any one asks me how to measure a shape in an amount of time I'd scream and run out the door, still screaming! Hello fellow readers. Our topic this term is the Amazonrain forest. Do you know how many bugs live in the Amazon rainforest? Did you guess 2,500,000 bugs? Don't worry if you didn't but that is how many there are. Last week we had a new girl join our class. I hope she will enjoy our school. In P.E we have been doing gymnastics. It is really fun. We have French lessons on a Tuesday. It is really fun because we have been learning about an island that has been taken over by the French. We are doing a biography about Queen Elizabeth the 1st. Yes I know. I only wrote about gymnastics and balances last week but here is something even better. Have you ever experienced being in a real human pyramid? Well if you have you`ll know how it feels but if you haven't listen in carefully. Being on the base Pyramid is painful but you can put your mind off it like thinking you're on a giant gummy bear. But being on the very top is even scarier than being the base if your too heavy the pyramid will tumble when the person got down from the top she was a bit shaken up and when the teacher asked her if she was alright she stumbled around saying "YES". In Red Class this week we are saying goodbye to Miss Apps who has been here since October and we will miss her very much. In science we are learning the parts of the flower. Do you know what the inside of a flower is? If you guessed stigma, well done! If you got it wrong don't worry; it’s not the end of the world. In PE we are learning to do gymnastics! We have not got on to the fancy flips but we have been balancing and working together to make shapes. We`ve been learning about where and where not to put our hands to support others; for example, never put weight on the spine or the neck otherwise it will hurt the other person quite a lot. We hope to get more Gym Equipment out and learn how to use them. This week in year 5 in maths we are learning how to read timetables. In English we are writing up are biography. It is quite fun. In P.E we are doing gymnastics. We did balancing in P.E today it was really fun . In Red Class we are learning about THE RAIN FOREST!! We have been finding about who and what lives in THE RAIN FOREST.We have all found lots of facts about animals and trees and how they live. Everyone has come up with some questions. Some were: What animal and trees are in the forest and why do people chop down trees? We are all enjoying our new topic and can't wait to answer our fascinating questions. In Red Class we are learning about Nelson Mandela in R.E . We are going to do a biography in English . In maths we are doing percentages. Last week we watched a pantomime in school. It was Puss In Boots. Useful website Some great maths games. Our Topic Web and our spellings. In Red class every one made an aquaduct . And if you are wondering what an aquaduct is, it is some thing that the Romans used to carry water! We had two weeks to make one. I made a small but detailed aquaduct from plastic card, glue and modelling hedges! When the two weeks were up Miss Beckwith and Mrs Green were amazed at the sight of our beautiful aquaducts; some small, some tall, some big, some huge!!! Some people's aquaduct were water proof! Finding out about life in the Roman army. 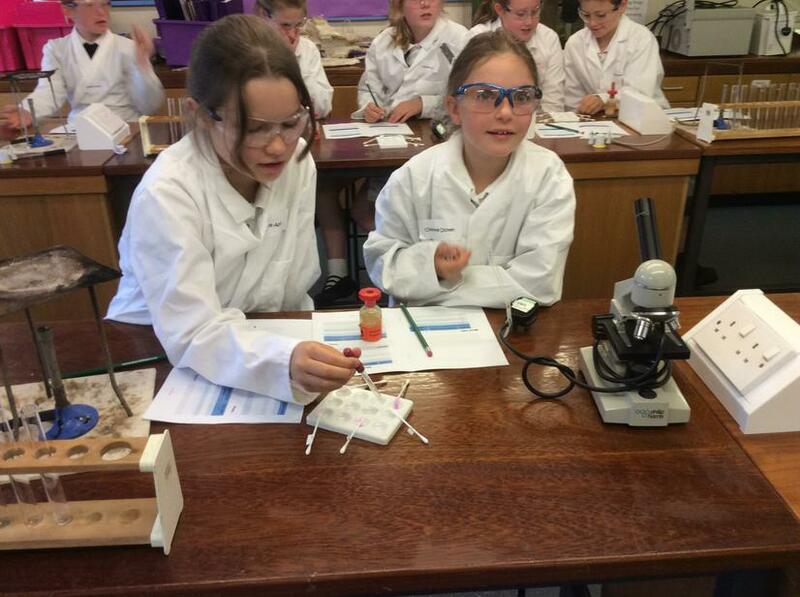 Girls in Science Day at Bruton School for Girls. 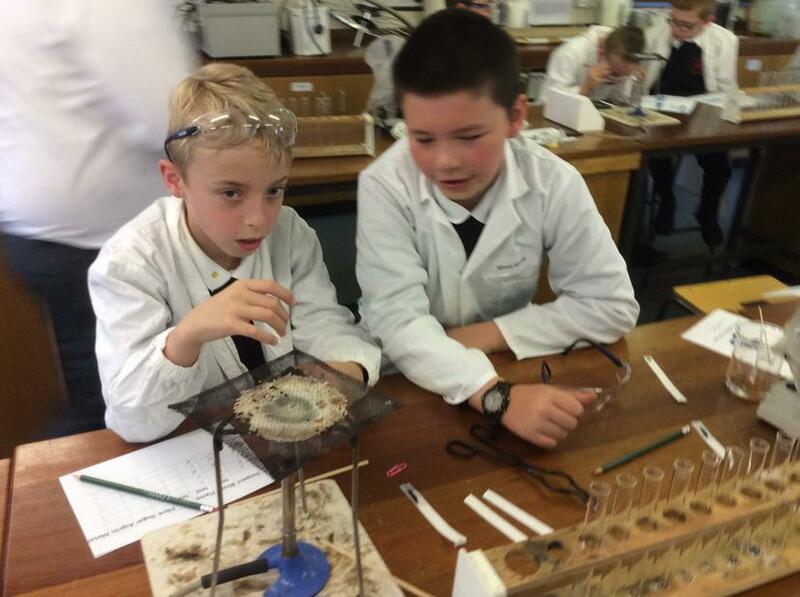 Boys having fun in science. 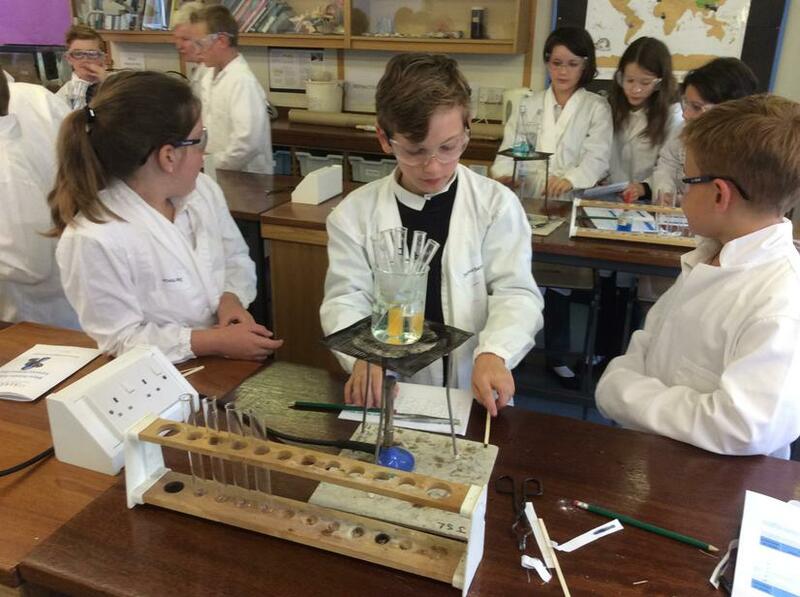 What happens when you mix chemicals together? Our Art Work. Cezanne- Apples and Pears. Making observational sketches of apples and pears. Colour mixing with oil pastel.